NEET aspirants can apply for NEET 2018 only online. 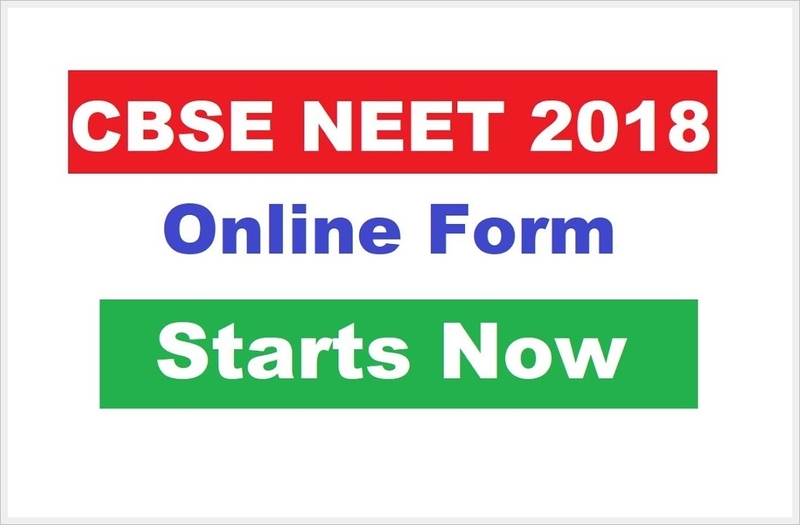 For NEET 2018 registration log on to NEET official website www.cbseneet.nic.in . Let’s examine the CBSE NEET 2018 application form & fee details. You need to be aware of certain things before taking up the task of NEET 2018 application form. The information that you must fill in NEET 2018 online application form includes your father’s/mother’s and your name with correct spelling, Aadhar number/registration number issued by CBSE/facilitation number/passport number/ration card number/bank account number/date of birth/ address/ mobile number/ Email ID etc. You must keep your documents ready. Indian Nationals – Adhaar Enrolment number (EID) or registration number issued by facilitation Center, Adhaar Number. Those belonging to Jammu and Kashmir, Assam or Meghalaya – Adhaar Enrolment number, Registration number, Bank account number, registration number issued by facilitation Center, Ration card number, Passport number or Number of any identity card issued by government. You must have scanned images of your latest photograph (size 10KB to 100KB) and signature (size 3KB to 20 KB) in JPG format only; while filling NEET 2018 application form. You must check the validity of the card, if you are paying through Debit/Credit card. Keep it ready while submitting NEET 2018 application form. You have the choice of paying through Net banking/UPI but follow the instructions during the online process. If you pay through e wallet, follow the instructions during the online process. You must keep the statement of bank/net banking transaction receipt/e wallet receipt bearing application/registration number for future reference. You must secure the hard copy of NEET 2018 online application form. If you fail to upload your photo and signature, your application will remain incomplete. Generation of CONFIRMATION PAGE is a sign of the correctness and final submission of application form. If the system does not generate the CONFIRMATION PAGE, it means that the process was not complete. Log on to NEET 2018 official website www.cbseneet.nic.in and download the information bulletin and replica of application form 2018 and read it carefully to understand NEET 2018 eligibility criteria and other requirements for submission of NEET 2018 online application. Go to the link “apply on line” and open the same. You must read the instructions and follow carefully the method of submission of NEET 2018 application form. STEP1: Fill the online application form for NEET 2018 and note down the registration number. STEP2: Upload your scanned photograph and signature. STEP4: You must secure the hard copy of CONFIRMATION PAGE of NEET 2018 online application form for future reference along with copy of proof of fee deposited. Open the link “proceed to apply online NEET 2018”. You must follow the instructions and complete the process of NEET 2018 registration. At the end of NEET 2018 application form, two links “Next & Preview” and “Reset” are given. If the information is correct, click “Next & Preview”, otherwise, go for “Back”. You must create password and enter OTP sent on the registered mobile number. On submission, the system will generate your provisional registration number and will display it on screen, send it to the registered mobile number and Email ID. At this stage, you will find an option to continue filling up your application by clicking on “Continue” or completing the form “Later”. If you select “Later”, you can log on to your account at any time before the last date to complete NEET 2018 application form. After STEP1, program will automatically take you to second link for uploading of photograph and signature. After you upload your photograph & signature, program will ( again, automatically) take you to STEP3 for payment of fee. At this point, be sure to follow the instructions very carefully. Further, the program will take you to STEP4 where you take out a hard copy of CONFIRMATION PAGE which you must retain till the declaration of result. Even after the successful submission of NEET 2018 application form and issue of registration number, CBSE will not consider you eligible for NEET 2018 if fee is not paid. You should be well acquainted with the technology of online submission of NEET 2018 application form. In case, you are having any problem, you can visit any common services centers for submission of NEET 2018 online application form. You must satisfy yourself before submitting the NEET 2018 online application form whether you are eligible to appear in NEET exam 2018 or not. You must fill the complete postal address with the pin code & Email address for correspondence. Also, ensure that mobile number and email address filled in the NEET 2018 online application form are absolutely error free because board will make communication by SMS or email only. You should fill code number against the column provided for qualifying examination passed. For Code details, click here. If you are appearing in class XII in 2018, you should fill up qualifying code as 01. In case, code numbers 02 to 07 do not apply, you must furnish complete details & your code would be 01. If you are from state of J&K, you need to submit online self declaration. If you want to change any information in NEET 2018 application form, there is fixed time duration, after the expiry of which, you cannot make such corrections. The board will reject incomplete application. So be careful. Though it is difficult to imagine otherwise, please submit only one application form. Otherwise, you will lose your candidature. You must remember that any online transaction password (OTP), generated on the NEET official website, while registering/submitting the form, will be valid for 15 minutes only. After the lapse of this period, you need to click on the link “Resend OTP” to generate new OTP. NOTE: – You will have to pay processing fee along with examination fee if you are making payment through Debit /Credit card/UPI/Net banking/e-wallet & applicable taxes of the respective banks. You must know that after submission of NEET 2018 application form, you cannot withdraw it. Also, you should not make any payout through Account/DC/CC of cyber café’s owner’s. As in case of refund, CBSE will do the same in favor of the given Account/DC/CC. You must enter the date, month & year of birth as per English calendar. DOB you enter should match that on your Aadhar card. Your passport size photograph should have a white background & further, you should indicate your name clearly along with date of taking the photograph. Bear in mind, you must take your photograph on or after 01/01/2018 without wearing cap or sunshades. If you use regular glasses it’s alright! Especially relevant, do not upload Polaroid & computer generated photos, as the system will not accept them. The board will reject your form if the photograph is de-shaped/engineered/digitally mastered. Be careful, such and act will read as UFM (unfair means). You must upload your signature which should be in running handwriting. If you write full name in capital letters, the system may rejected. Further you MUST bring an additional photograph (passport size) with your name and date of taking the photograph and this is for the attendance sheet on the day of examination. You can download the Admit Card of NEET 2018 Exam from the NEET 2018 official website www.cbseneet.nic.in 2018. You will not receive the Admit Card by post. Once you download the Admit Card, system will send you an email containing a copy of Admit Card in pdf format. If you have Adhaar, you must enter Adhaar number, name, date of birth and gender during NEET 2018 registration. If you are not enrolled for Adhaar, please make an application for Adhaar enrolment which you can do by visiting any Adhaar enrolment center. CBSE has setup centers in each city of examination for Adhaar enrolment where you can apply for free. The list of these centers is available at NEET 2018 www.cbseneet.nic.in and, in case, you have not received your Adhaar by the time of NEET 2018 online application form, you will enter fourteen digits long Adhaar enrolment Id. Don’t forget to include the ‘slash’ . If by any chance such facility is not available at the facilitation center, you should submit a request for the same and the center will issue a registration number which you must fill during NEET 2018 online application. The above doesn’t apply in J&K, Meghalaya and Assam. If you have passed or are appearing in class XII examination form J&K /Meghalaya/Assam and you don’t have Adhaar, you will need to enter Bank Account Number/Passport Number/Ration Card number or any other govt. Id, provided you select the city of examination in these states only. If you are an NRI without Adhaar, you will need to enter the Passport Number. Same is the case with OCIs, PIOs and foreign nationals.